Do you need a process Weighing solution for your business? Flow Force Technologies has achieved recognition in Australia as a provider of high quality process weighing & sampling products to heavy industry, specialising in smart solutions to difficult weighing tasks, using the latest advances in technology, and always ready to listen to client feedback based on their real world experience. Our aim is to continue to help industry work smarter and cleaner and make the world a better place to be. Applications include Grain Handling, Mineral Sands and Cement Mills. To measure the mass flow rate and/or the batch weight of dry bulk granular solids and powders in vertical or inclined chutes or discharging from tubeveyors or air supported belt conveyors. To control feed rates via screw feeders, rotary valves etc. To measure & control discharge rates and total weight discharged from silos to rail or road trucks. To measure and control loading of containers etc via bulk loading chutes etc. To control blending of various ingredients. To measure daily production totals. 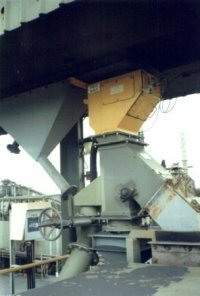 To measure the mass flow rate and/or the batch weight of wet or dry bulk solids on conveyer belts with idlers. Specialising in low capacity conveyors. To measure & control loading of containers. Built-in, fully sealed optical speed sensor. To obtain a representative sample of dry or wet material flowing into, through or discharging from a process. Impact weigher with built-in sweep sampler. Impact weigher with built-in sampler and inlet control valve.